Investigators worked Tuesday at the site of the second bomb explosion that went off near the finish line of the Boston Marathon on Monday. Investigators combing through the grim aftermath of the deadly Boston Marathon terrorist attack have found evidence that timing devices were used Monday to detonate the bombs that ripped through race spectators on Boylston Street, said an official briefed on the investigation. Working with fragments painstakingly gathered at what is considered the city’s largest-ever crime scene, they also ­determined that the two bombs were probably fashioned from 6-liter pressure cookers, filled with nails and small ball bearings, like buckshot, to increase the carnage, and then hidden in black nylon bags or backpacks and left on the ground. FBI bomb experts at the FBI Academy in Quantico, Va., will try to rebuild the devices from fragments that include a circuit board that indicated the bombs were detonated on a timer, rather than remote control. The bombs, which detonated 12 seconds apart just after 2:50 p.m. Monday near the finish line of the world’s most prestigious road race, killed three people, injured 176 others, and set an entire city on edge. Seventy remained in Boston hospitals Tuesday night, including 24 in critical condition. Extra police patrols roamed eerily quiet streets on Tuesday, while other law enforcement officials started reviewing videos and photos – frame by frame – of one of the most photographed events in the world. Security fears disrupted two flights at Logan Airport, as airlines responded to the concerns of jittery passengers. And the White House confirmed that President Obama would visit the city on Thursday, to speak at an interfaith prayer service. The FBI, which is leading the massive investigation into the bombing, asked the public for tips on anyone who may have been lugging a heavy black bag near the finish line. Local and federal law enforcement officials are scouring thousands of photographs and video for some sign of the bomber. “The person who did this was someone’s friend, co-worker or neighbor,” said ­Richard DesLauriers, special agent in charge of the FBI’s Boston office. “Somebody knows who did this.” No one has claimed responsibility for the atrocity and “the range of suspects and motives remain wide open,” ­DesLauriers said. As the investigation broadened, so did the city’s mourning, as more details were ­revealed on the three people who died — an 8-year-old boy from Dorchester, a 29-year-old woman from Medford, and a Chinese graduate student at Boston University. A state-run Chinese newspaper said the third victim was Lu Lingzi, the Associated Press reported Wednesday. An editor at the Shenyang Evening News said that Lu’s father confirmed his daughter’s death when reporters visited the family home. Scores were injured Monday by the blasts, many of whom lost limbs. Bostonians shaken by the ­attack woke Tuesday to a changed city, with heavily armed officers standing sentry at intersections, MBTA stations, the airport, and even city parks. During briefings, Governor Deval Patrick announced that the interfaith prayer service, which Obama will attend, had been scheduled for 11 a.m. at the Cathedral of the Holy Cross. 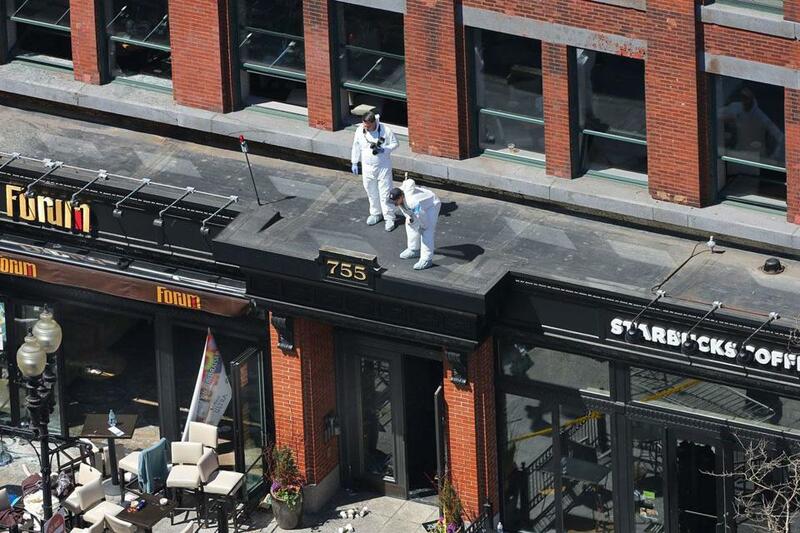 According to the official briefed on the investigation, the first of the two bombs to ­explode was placed on the ground on Boylston Street, across from finish-line viewing stands where dignitaries had been sitting earlier, including Patrick; the second bag was placed on the ground about 75 to 100 yards away, outside the Forum restaurant at 755 Boylston St. The bomb-making technique used in the attack was detailed in a 2010 article in the online magazine, Inspire, published by the terrorist group Al Qaeda. The technique was used in the attempted bombing of Times Square in 2010, as well as in an attack in Pakistan earlier that year. However, security experts said the technique is akin to a scaled-up pipe bomb, and has been used in attacks by organizations not related to Al Qaeda. 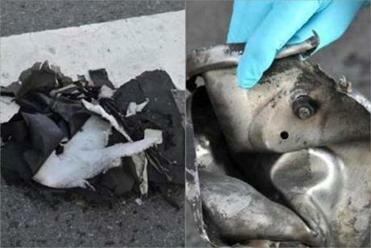 At left, the remains of a backpack the FBI says contained one bomb, and at right, the remains of a pressure cooker that the FBI says was part of one of the bombs. A pressure cooker bomb “is not a high-tech device,” said Michael White, director of explo­sives and training with MSA Security, a consultant company, in an interview. Typically, such a device would contain low-level explosives inside a container that could withstand a great deal of pressure. The explosives would then be ignited with some type of power source, setting off the explosion. Risk analyst Alexia Ash said the early signs suggest the ­attack was more likely perpetrated by a home-grown terrorist, rather than a foreign network like Al Qaeda. Law enforcement officials also renewed a call Tuesday for photos and video shot by race spectators, on the theory that somebody among the untold thousands of people who documented the scene has pictures of the bomber. Homeland Security officials asked departing passengers at Logan Airport on Tuesday to share their photos or videos of the finish line, said a law enforcement official familiar with the investigation. 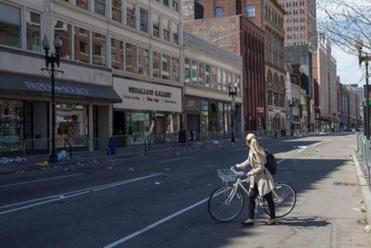 Police are also guarding specific areas around Boston they deem vulnerable, particularly Jewish places of worship and institutions, according to a ­Boston Marathon response plan obtained by the Globe. Boston police assigned two officers to patrol the Consulate General of Israel at Park Plaza, and ordered officers throughout the city to randomly patrol 14 other Jewish institutions, including temples, hospitals, a day care center and a senior center. Officers assigned to the South End district were ­ordered to patrol Jewish campus organizations, such as Northeastern University Hillel and Boston University Hillel. More than 140 officers were sent to patrol hotels across the downtown area and more than 100 were sent to guard the crime scene perimeter, according to the plan. Boston police have said they have heard no specific threat. The plan, officials said, reflects overall concern police would have over any locations they deem vulnerable, because of their symbolic importance, their geographic location, or — in the case of Jewish institutions — their history as targets of terrorism. Investigators on Monday had questioned a Saudi national, a student at a Boston-area university, who had been hurt in the explosion. US officials informed the Embassy of Saudi Arabia in Washington Monday night that the student was not a suspect and was cooperating with the investigation, according to Nail Al-Jubeir, spokesman for the embassy. At Logan International Airport Tuesday morning, a United Airlines flight to Chicago was brought back to the gate ­after passengers expressed fear over two people speaking a foreign language, said aviation authorities. Passengers and bags were taken off the plane and re-screened, and two people were rebooked on a later flight, said United Airlines spokeswoman Christen David. Soon afterward, a US ­Airways flight arriving from Philadelphia was kept from the gate due to suspicions about a checked bag on the plane. Passengers were bused to the terminal. The bag was rescreened and cleared. Traffic snarled around the 12-block crime scene in the heart of Back Bay, which remained blocked off for the investigation. One law enforcement official briefed on the investigation said Copley Square presents a challenging crime scene. “We are taking evidence off the tops of buildings,” the official said. Martin’s mother, Denise, and his sister were seriously wounded in the attack. The community remembered him at a candlelight vigil last evening in a Dorchester park, attended by thousands. Maria Cramer, Katie Johnston, Erin Ailworth, Martine Powers, Maria Sacchetti, Andrew Ryan, Milton J. Valencia, Travis ­Anderson, Meghan E. Irons, and Chelsea Conaboy of the Globe staff and Globe correspondent Colin A. Young contributed. Mark Arsenault can be reached at marsenault@­globe.com.